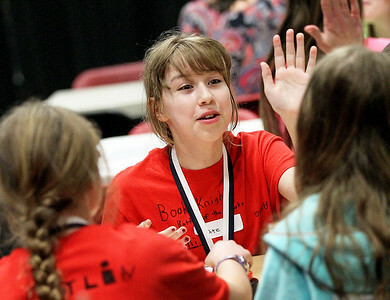 Candace H. Johnson-For Shaw Media Katelyn Hampton, 11, of Lindenhurst high-fives a member of her Book Knights team after they answered a trivia question correctly during the Battle of the Books at Palombi Middle School in Lake Villa. Candace H. Johnson-For Shaw Media Eric Hampton, 11, of Lindenhurst (center) works with the Book Knights team on answering a trivia question during Battle of the Books at Palombi Middle School in Lake Villa. Candace H. Johnson-For Shaw Media Jeremy Hall, 13, of Lindenhurst (center) works with his Awesome Failures team on answering a trivia question during the Battle of the Books at Palombi Middle School in Lake Villa. Jeremy's Awesome Failures team came in first place. 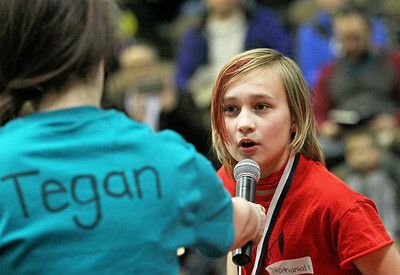 Candace H. Johnson-For Shaw Media Tegan Anclade, with the Lake Villa District Library, holds the microphone for Nathanial Kiscellus, 11, of Lake Villa as he answers a trivia question for his Book Knights team during the Battle of the Books at Palombi Middle School in Lake Villa. Nathanial is a fifth grader at the B.J. Hooper Elementary School in Lindenhurst. 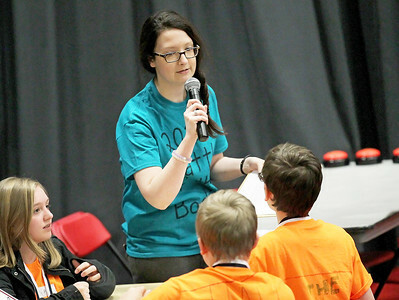 Candace H. Johnson-For Shaw Media Tegan Anclade, of Lake Villa, with Youth Services at the Lake Villa District Library, talks with the Awesome Failures team as they answer a trivia question during the Battle of the Books at Palombi Middle School in Lake Villa. 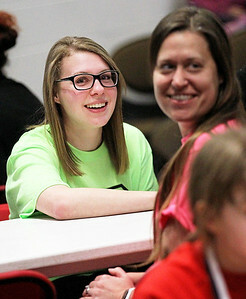 Candace H. Johnson-For Shaw Media Katie Ozimek, of Round Lake (on left) with the Eat, Sleep, Read team listens to a trivia question during the Battle of the Books at Palombi Middle School in Lake Villa.Ozimek is a 7th grade English Language Arts teacher at Palombi Middle School. 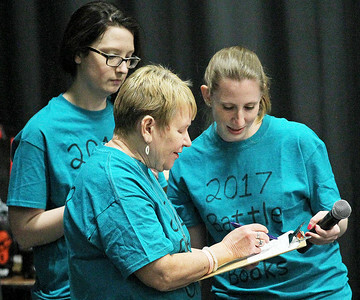 Candace H. Johnson-For Shaw Media Tegan Anclade, youth services, Rachel Reinwald, school liaison and librarian, both with the Lake Villa District Library and Jean Short, of Lindenhurst, volunteer, (center) figure out what teams placed 1st, 2nd, and 3rd, during the Battle of the Books at Palombi Middle School in Lake Villa. 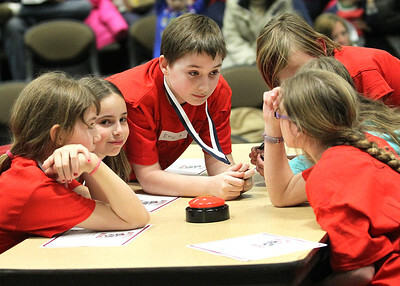 Eric Hampton, 11, of Lindenhurst (center) works with the Book Knights team on answering a trivia question during Battle of the Books at Palombi Middle School in Lake Villa.